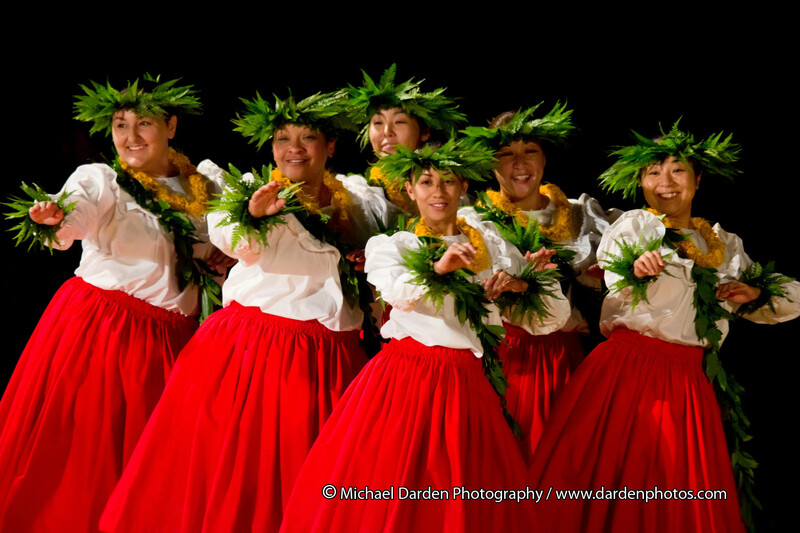 Members of halau Kekaiaulu Hula Studio perform during the 2010 Moku O Keawe Hula Competition. Photography by Michael Darden. KOHALA COAST, HAWAI‘I—The sixth annual Moku O Keawe International Hula Festival will take place November 3-5, 2011 at Waikoloa Beach Resort on the Big Island’s Kohala Coast. The Festival, presented by Moku O Keawe Foundation, features topnotch women’s hālau from Hawai‘i, the Mainland USA, and Japan, competing in kahiko, ‘auana and kupuna divisions, solo and group. In keeping with the Foundation’s educational mission, intensive, hands-on workshops in hula and related arts, and excursions to cultural sites, offer a deeper experience. Taught by noted cultural practitioners, the classes include dance, chant, crafting of musical instruments and more. In addition, Moku O Keawe’s extensive Hawai‘i Marketplace gives participants many opportunities to see, touch, smell and taste made-in-Hawai‘i products from island vendors. Lei of various styles, hula implements, aloha wear and jewelry, fine arts, woodworks, woven items and others will be available for sale. The Moku O Keawe International Festival is sponsored by the Moku O Keawe Foundation, a private nonprofit organization. Dedicated to enhancing, enriching and educating the practice and development of hula and its associated arts, the purpose is to build, strengthen and inspire the living cultural traditions of Hawai‘i. Major supporters include Hawaii Tourism Authority/Hawaii County CPEP, Waikoloa Beach Resort, Office of Hawaiian Affairs, Native Arts and Cultures Foundation, Louis Vuitton, Big Island Candies, Queens’ MarketPlace, Kintetsu International Hawaii, Waimea Music Center.